It’s that time of year… where moms in our expat chat groups find themselves in a panic because they’ve just found out that NOW is the time to have their 2 year old start interviews in order to register for school next year. It’s not quite as simple as heading down to the neighborhood public school with your water bill to prove you live in the district. There are a lot of options, and you have to decide it while your baby is still in diapers! So what do you need to consider when choosing a school for your child? This often comes as a surprise – Arabic is not the educational language for most private schools in Lebanon. So the first question you need to ask yourself is which language do you want your child educated in – French or English? We chose an English medium school, which means our children take Math, Science, English of course, and all their specials (PE, art, etc) in English. Arabic is taught as a language, as is French, and eventually (starting grade 4 for us, this depends on the school and the system) social sciences such as history and geography are taught in Arabic. For us, this was an easy choice – neither of us speak French and we wanted to be as involved with our kids’ education as we could be. For others, the language you choose might not be quite as simple. We love that our kids school starts French every day from the first year! You need to decide on your budget for education. School fees can range anywhere from $3,000 – 20,000 per child per year. Be aware that the fees change depending on your child’s grade, sometimes doubling from kindergarten to grade 12, so it’s a good idea to ask for fees for each grade to make sure the school will still be in your budget in a few years. Make sure to also ask about other supplemental fees (books, stationary, uniform, activities, etc) and whether the school offers discounts for siblings. Another aspect of cost to consider is the atmosphere that comes with a school being very expensive or very cheap. How comfortable are you or your kids in different socioeconomic groups and what comes along with that? This is a huge consideration that I can’t stress enough… in our opinion, the closer you can be to the school the better! Traffic in Lebanon is notoriously terrible and inconsistent. It could take you 20 minutes to get to your kids’ school or an hour and 20 minutes with no rhyme or reason. Of course all schools have buses at an additional cost that will save you time on the road, but not necessarily your kids. We’ve always lived within walking distance of school, and it’s honestly been the best decision we could have made. That’s not always possible of course, but location should definitely be something you consider as you choose a school for your kiddos. This is the piece of the equation that we didn’t really do a lot of research on – because we had no idea we needed to! Not only do you have several languages to choose from, but there are multiple educational systems each with different curriculum, requirements and theories of education. Every school in Lebanon is required to offer the Lebanese curriculum. But if your child has a foreign passport, you have the option of registering for the French Bacc, High School, or International Baccalaureate (IB) program. The school we chose for our kids only has the Lebanese system. When we chose it seven years ago, all we really knew about it was that it meant our kids would have to do Arabic with all the native speakers (as opposed to taking a special Arabic for foreigners class) and they would have to sit for the government exams in grades 9 and 12. We wanted our kids to learn Arabic, and figured that because they were born here, they should be able to do what any other child can do, academically speaking. And that has proven to be true. What we didn’t realize were all the other things that entail being enrolled in the Lebanese system. It’s not only about the curriculum, but educational styles as well as values play a huge role in the education your child will receive. For example, the Lebanese system is very math/science heavy, rote memorization is still highly valued, and the brevet (grade 9 exams) are notorious for putting a lot of pressure on students to memorize a lot a lot a lot of useless information. Some kids will thrive in that kind of system, others won’t. For us it’s not a question anymore of IF our kids can do it, because we know they can, but more of a question of if we WANT them to. We love our school, but the jury is still out on how long our kids will continue there. What kinds of activities are offered both during the day or after school? What place does religious education have in the school? You’ll find a wide range – from not religious at all (including Christmas/Ramadan celebrations) to mandatory chapel or religion classes. What percentage of the school are expats? I was reading a report recently that one of the main reasons that expats return to their passport country is because of children’s education issues. While there is no perfect school, and you will find things you love and hate about any school, finding a school that is a good fit for your family will go a long way in making your experience as an expat in Lebanon a positive one. For those of you here in Lebanon, what have I left off? Any questions you would add? ‘Bu’ arrived in Lebanon at the age of 19 with a simple dream – to dress nicely. The chance to work seemed to be the first step to fulfilling that dream. It got her out from under her alcoholic father’s hand and away from the piece of canvas that was her family’s only shelter from the Sri Lankan elements. A chance to work. To support her family. To break the cycle of poverty. To fulfill her dreams. Those dreams were dashed when she arrived in Lebanon. As with many domestic workers, her passport was confiscated upon arrival. She was never paid for her work, barely fed, and refused all contact with her family. For a year she lived like this. And then one day she picked up a phone to call her neighbors back home, hoping to hear a familiar voice, to pass on a message to her family. When her “madame” found out, she grabbed a kitchen knife, forced Bu against a wall and stabbed her just below the neck. Fearing for her life, Bu fought back, and is now serving a life-sentence for murder. She’s been in prison for 19 years. Bu’s story doesn’t end in a prison cell. In the midst of the darkness her newfound faith has given her comfort, peace, and hope. A friend of mine has also helped give Bu a sense of purpose. She and some other prisoners (both from Lebanon and abroad) have started making soft soled shoes for babies and small toddlers. Not only is it a source of income – many of these women still have families depending on them – but the act of working, of creating, of doing something worthwhile is life changing for those whose futures seem hopeless. Soft soled shoes are actually the only kinds of shoes my kids have worn until they were about 18 months old. Barefoot is best for early walkers, and these shoes bend and flex like a bare foot would, while protecting little toes from cold hard floors or dirty sidewalks. The shoes come in three sizes. Size 1 comes with felt soles and is perfect for a new baby. Size 2 and 3 have genuine leather soles and fit pre-walkers and walkers. Shoes are $15 a pair and come with a gift bag. Pick up is in Hamra or Mansourieh. I was at a play place a few weeks ago chatting with another mom about our summer plans. She made an off-hand comment about how play places like the one we were in made her nervous and how nice it must be to spend the summer in a safe place like America. At that particular moment, I couldn’t see any of my three kids, including my one year old. They were all climbing or bouncing or playing somewhere in the jungle gym in front of us. In America, I would NEVER let my children out of my sight. One of the conversations we will be having soon with our girls is how to interact (or more appropriately NOT interact) with strangers when we travel. Random man kissing your child on the cheek and giving her a piece of candy in Beirut? An everyday, socially acceptable occurrence. Random man kissing your child on the cheek and giving her a piece of candy in America? Call the police. When we are back in the States, one of the most common questions we get asked is about safety. These days I very rarely feel unsafe in Beirut. The last time we were in America, we took the kids to see a movie. The theater was empty except for another family and about halfway through the movie, two teenage boys came in and sat down in the front row. My heart began to race and immediately I started thinking about what to do if they started shooting at us. My brain was telling me that they were probably just bored and theater hopping, but my pulse was telling me a different story. After about five minutes, they left giggling and it hit me like a wall of bricks. In that moment I felt more scared for my safety in America then I do in Beirut. It’s a weird thing. And I blame the media almost entirely for it. What stories do you read in the news about Beirut? Bombs and violent protests, right? And what are we hearing right now from America? Rapists in the bathrooms and child traffickers in Target. Seriously. I’ve spent two thirds of my life living in the USA, and yet there is a small part of me, in the deep deep recesses of my mind that is actually nervous about taking my kids there. It goes back to what I’ve blogged about before – that what is known is more comfortable, it feels more safe, it’s easier to relate to. I can’t even begin to describe what a strange feeling it is to realize that in so many ways Beirut is becoming more “known” to me than the US. I felt this in a way when I moved back to America after living overseas for a few years when I was young. I didn’t know what clothes were cool, what bands teenagers my age were listening to, what TV shows were popular. But this – where I feel “safe” – hits at a deeper, more primal level. It throws me off. It shakes up my thoughts on my identity. But in the midst of all the inner turmoil, I can’t help but be thankful for a God who is always there, even in a scary place like… America. Public transportation is widely available in Lebanon. It can be really cheap, and once you understand the system and have just a little bit of Arabic, it’s not too hard to navigate. We didn’t have a car our first two years in Beirut and in all that time, we only rented a car once, to go shopping for baby furniture. There are lots of options to get you where you need to go, with a wide range of prices as well as levels of convenience. At first glance it may seem like there is absolutely no bus system. There aren’t really bus stops or time tables, and even the bus routes are more like suggestions. But once you get a general idea of where the different buses pass, it’s a great option for getting around town. There are two types of buses, big buses and small minibuses. Both use the same system. You stand on the side of the road of the route, wait for the bus you need with empty space to slow down, and hop on. The number of the bus is posted on the front window, and the bus will have a red license plate to let you know it’s officially registered as public transportation. To be honest, the bus is my least favorite option for getting around Beirut. My first big bus ride I was pregnant, car sick, and what should have been a 20 minute ride at most took over an hour. Not because there was traffic, but because the bus driver was driving at a snail’s pace looking for passengers. He also took several coffee breaks and pulled over numerous times to chat with friends he saw walking by. The rest of the passengers were just as fed up as I was with the driver, so I know it wasn’t a typical bus ride, but it ruined the whole big bus experience for me. As the big bus feels slow and clunky, the minibuses feel a bit like Frogger. These things are fast. I learned early on not to sit near the door because it’s often left hanging open and the way these guys dart in and out of traffic leaves me fearing for my life and my belongings. But they will get you where you need to go, they are plentiful, and they are the cheapest option there is to move around the city. Choose your minibus wisely. I for one like to have a driver who at least pretends that traffic laws apply to him. The service is the form of public transportation that I use the most. It’s a shared taxi that costs 2,000 LL for short trips. It has no specific route. You stand on the side of the road and when a car with a red license plate approaches you (often with a honk), you say you want a service and the name of the neighborhood or street you want to go to. They will either tip their head back and move on, tell you to get in, or negotiate if the driver thinks your destination is a bit too far. He may ask you for “servic-ein” meaning 2 services, or 4,000 LL. You pay per seat, so if you have a child in your lap you only count as one passenger. The service won’t take you door to door, but will take you to the general area where you want to go. It may or may not be the most direct route, depending on if he has or picks up other passengers on the way, but I’ve found that service drivers want to be efficient, they want to pick up and drop off the most passengers as possible without going out of their way, so it’s rare that I get taken on a huge tour of Beirut before being dropped off at my destination. Sometimes it can be hard to tell the difference between a service and a taxi, so it’s important to agree with the driver up front that you expect a shared ride. If there is already someone in the car, you can assume it’s a service, although it doesn’t hurt to double check. Generally speaking, the nicer looking cars operate only as taxis. It’s also wise to take a look into the car before hopping in. I personally don’t get in if there is only one seat left and the car is full of men. I’m also careful if there is only the driver and one male passenger, although it’s not a hard and fast rule for me. It’s a rare instance when you can’t find a service willing to take you where you want to go inside Beirut, so it’s usually my go-to when I need to utilize public transportation. Taxis come in all shapes and sizes. As with the other forms of public transport, they will have a red license plate letting you know they are authorized. Some will not be marked in any other ways, others will have the name of their company and phone number written. You can order a taxi by phone or by waiting at the side of the street for one to pass. Most taxis don’t run on a meter, so make sure you agree on the price before you get into the car. The driver will take into consideration both the distance and the amount of traffic, although some companies will have set rates between certain parts of town. We generally take taxis to the airport, and it costs us about $20 from Hamra if we call and arrange it ahead of time. Everyone will have their favorite company to recommend, and we’ve had good and bad experiences with several different companies, as well as good and bad experiences with random taxis who we’ve grabbed as they drove by. But taxis are a great way to go if you have a group of people, a lot of luggage or need to be at somewhere at a very specific time. Uber is new and becoming more and more popular in Beirut. As in other places, you order your car using the app and pay a set fee plus the metered cost of your trip. I’ve never tried it personally, but have friends who rave about the service. There’s always Walid. I’m not sure I’m comfortable with taking a ride with him to eternity, but at least I know he’s an option! Personally my favorite way to get around Beirut is by walking, but I’m thankful when I get stuck in a rainstorm or need to go somewhere out of my normal radius to have so many other options for getting where I need to go. Once you get a feel for things, you really can go almost anywhere for just a few dollars! Lebanon is the land of delivery. You can order almost anything and have it delivered to your door. There’s the expected: pizza, McDonalds, sushi, mana2ish. Then there is everything else, ranging from the strange to “why didn’t I come up with that!”: dry cleaning, DVDs, a lady to wax your legs, a phlebotomist to draw your child’s blood. And then there is the life-changing: groceries. Now I’m not one of those people that hate grocery shopping. I honestly don’t really mind it as far as things I should be doing as an adult/housewife/mom/whoever goes. But figuring out when to go has always been a struggle for me. Between Luka’s nap and picking up the girls from school is a small window of time and Beirut traffic is notorious for messing with the most tightly scheduled day in catastrophic ways. So I ended up doing my grocery shopping on Saturday, which I hated because it is the one day of the week where we don’t have work. And I want to spend that day with my family, not wandering the once-again reorganized aisles of the supermarket. And then I saw the sign. Spinneys. Delivers. I rushed home to check the website and found the map showing the delivery areas. Pretty much all of Beirut it covered, except my neighborhood. You’ve got to be kidding me. But the top of the webpage says that more delivery locations will be added soon, so I stalked that website for months. One day I was coming home from somewhere and saw a Spinney’s delivery truck driving right through my neighborhood! I checked the map but we still weren’t listed as an option, so I called the customer service number to see what the deal was. She confirmed that they don’t in fact deliver to our part of town, but I could call the delivery guy and maybe arrange to meet him on the side of the road somewhere. Seriously? So I continued waiting. And stalking. A few months later a friend called customer service, also to ask about getting delivery to our part of town. And the sneaky customer service rep told her just to choose the closest neighborhood and then write out directions to her house…. and they’d deliver, no problem! I have to say, even with all the excitement, I was a bit skeptic. But it has been all I hoped it would be and more. It couldn’t be easier. Just like any online shopping site, you choose the items you want, put them in your virtual cart and then choose your personal shopper, delivery day and time and how you want to pay. The morning of your delivery, you will get a call from your personal shopper. If there is anything that wasn’t available, she will give you other options (including the prices) and you can decide if you want to replace it or leave it off your list. You get a text message when the delivery truck leaves the store with the exact amount you owe, and in the months we’ve been using the service, a delivery has never been late. Delivery is free, although I do tend to generously tip the delivery guy. We’ve had a few small mistakes. One time I ordered cream cheese to make a cheesecake for Caleb’s birthday, but we got some nasty processed cheese instead. I called customer service and she offered to send someone the next morning with the cream cheese I wanted. While I didn’t accept her offer as it seemed a little silly for a bit of cheese, I was happy to know that they would have done whatever necessary to fix their mistake. I can’t even begin to say how helpful Spinney’s Delivery has been for this busy mom. I save so much time. I can “shop” after the kids are in bed while in my pajamas, and choose the most convenient time for my groceries to be delivered. I also find I save money. No more impulse buys because something shiny caught my eye at the end of the aisle. There are some downsides too, of course. You don’t notice as easily when something is on sale that you might want to stock up on. Buying fruits and vegetables is difficult online… I like to see and touch them. But there are plenty of fruit and veggie stands in the neighborhood that I can buy from if need be. So for us the positives far outweigh the negatives. I much prefer the website over the app, mainly because of the “Favorites” feature. You can mark the items that you buy every week as Favorites and then when it’s time to shop, you open your Favorites list and can add items directly to your cart without needing to search. You can also see your Past Orders and duplicate the order if you end up ordering the same things each week. It helps a lot if you are familiar with Spinneys products. If you know what brands Spinneys usually has available, it will make searching a lot quicker. You can find items either by browsing the categories or searching. The search feature isn’t the greatest, but if you know the brand you are looking for that seems to be one of the best ways to search. The website isn’t exhaustive. There are things that I know are on the shelves, but no matter how I search for it online, it doesn’t show up. But at the very end of your order, there is a box for comments. You can type in what you are looking for there. Bulk nuts for example aren’t in the database, but I always order 300 g of bulk dried cranberries and the shopper has no problem filling the request. One plus of the app is the barcode scanner. Instead of searching the database by name or category, you can just scan the barcode of the product you already have at home and it will find it for you (assuming it’s available). Know there is a 100,000 LL minimum order. For me that is no problem, but if you are buying your meat and produce at other places that might be harder to hit. Ordering on the weekend means the traffic is less and the deliveries have tended to arrive on the earlier side of the time frame chosen. But, ordering during the week means the shelves in the actual store are more fully stocked and there is less chance that an item won’t be available. I promise I’m not getting paid to write this post! Nor do I get anything for referring friends. It has just been such a huge help to me to have my groceries delivered… gotta share the love! Now if I could just find someone who would deliver me a chai tea latte, I’d be all set! On Thursday evening, Beirut was attacked by suicide bombers. Did you know that? 43 dead, hundreds wounded. My Facebook newsfeed was quickly filled with people frantic for news of friends and family, soon followed by the faces and names of those murdered. The father who tackled the third bomber, saving hundreds of lives, but losing his own. The nurse on his way to work. The three year old boy who in a split second was seriously injured and made an orphan. Mourning and grief. Fear and dread. Then two days later, Paris. More than 100 dead, even more wounded. My newsfeed fills with people frantic for news of friends and family. Stories of the horrific events start to filter out and posts start popping up, “Pray for Paris.” My newsfeed soon becomes full of my friends and family who have changed their profile picture to the French flag. But then there’s another emotion starting to overtake my newsfeed. A new one from my Lebanese friends: Hurt. Anger. A sense of abandonment. Why is the life of a Parisian worth more in the world’s eyes than a Beiruti? Why is every profile picture now a France flag, and yet we never had that option when tragedy struck our community? This is not to take anything away from the horror of what happened in Paris. My Lebanese friends would be the first to say that. In fact many of them have also posted their own prayers for Paris. But I feel as someone living in between two cultures in many ways, I might have some insight – for both sides – as to why the imbalance and why it matters. When the bombing hit Beirut, it was actually the leading story on CNN’s international page. It was described as a suicide bombing in a Hezbollah stronghold. But what if I told you the bombs went off in a neighborhood? Homes, shops, cafes. One right outside of a school. It didn’t kill soldiers fighting in a war. It killed children. Moms and dads and sons and daughters, on their way to work, home from school, or out for dinner. Does that change your mental picture at all? Would you pray for us more knowing it is “innocents” going about their daily lives who were ruthlessly and senselessly murdered? Anytime a life is cut short, whether by violence, disaster or disease, it is mourned. Do you know that every 3 minutes, a child is diagnosed with cancer? But does that mean each individual child is not worth fighting for, praying for, grieving for? Of course not. No matter how often it happens, you do not get used it it. We come up with different ways to cope, yes. But no, we are not used to it. There is no question that Paris was an attack of larger magnitude. Simultaneous attacks in multiple parts of the city are a big deal. So many people dead and injured. I read that it’s the day with the most casualties in France since World War 2. Tragic. Huge. Worth all the weeping and mourning that we can give. This is not intended to take away from the magnitude of the attack in Paris in any way. But does anyone remember, or did you even know that this spring 147 students were murdered by terrorists at a college in Kenya? Why is that so different in the eyes of the world? Grief is never a competition. We should grieve with all of those who are grieving. Whether in Paris, or Beirut or Kenya or in the house at the end of our street. Every life cuts short deserves our tears. When he woke up on Saturday morning, Caleb was browsing through his facebook and had an odd notification. Several friends had marked that they were safe in Paris. That’s how we found out about the terrorist attack. Facebook had enabled a button for people to use to let their friends and family know they were safe when tragedy struck. We don’t have that in Beirut. Add to that the flags, the prayers, the world leaders condemning the bombings in Paris as an attack on humanity, the entire West seemingly standing in solidarity with a city facing it’s darkest hour…. 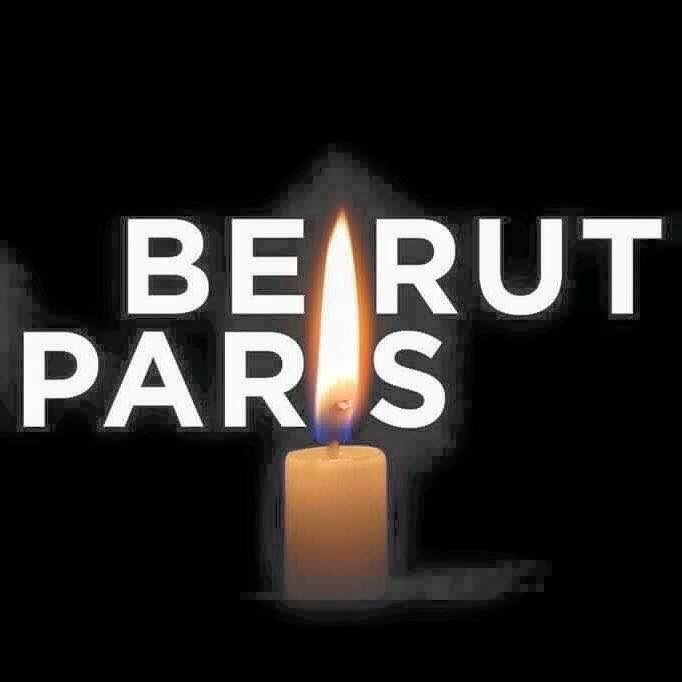 and whether right or wrong, the FEELING is that Parisian lives are more important than Beiruti lives. This is categorically not true. Every life has value. Death, no matter how or where it comes, is worth grieving. I know that most (I will not say all, because I’ve read your status updates and the articles you’ve shared) of my friends and family in the West would agree with me. Of course, we believe that all life is valuable. I know most would never say that an Arab life is worth less than an American or a European life. But here’s the thing. If by our actions and our words, a whole community of people FEEL as though their lives aren’t seen as worthwhile, then we, the West, are doing something wrong, and we need to fix that. This is a theory I’ve had for a few years now. I think that when faced with tragedy, one of our first coping mechanisms is to tell ourselves that “it could never happen to me.” I suspect this is universal, but I’m no expert and could be wrong about that. I’ve seen it in myself and in many of my friends. A bomb goes off, a shooting happens, a natural disaster hits and we start giving ourselves reasons why it is something we don’t need to fear. There’s a war there. I never go to that neighborhood. I don’t associate with those people who were targeted. Our country has better infrastructure to survive that earthquake, hurricane, tsunami, whatever. While deep down inside we know that tragedy can strike anyone, anywhere, I think this coping mechanism of distancing ourselves however we can helps us move through our daily life without fear. But for many of us, at some point, tragedy will hit too close to home to rationalize away. For me, it was the December 26 bombing in 2013. It was right around the corner from our house. We felt it and heard it and ran to hide in the bathroom in case there was a second bomb. Had it been another morning, I would have been walking by. There was no rationalizing it away this time. But for the grace of God, my family could have been killed by that car bomb. I think Paris is that for many Westerners. Those streets have been walked by many. We all go to restaurants and concerts and sporting events, so we can picture ourselves there. The streets look like the streets in our cities, in our neighborhoods. While my Arab friends think Americans grieve for Paris more because the victims look like them, I don’t think that’s true for most. I think what makes Paris so scary for Americans is because it’s a realization that, “that could be me.” Whether right or wrong, intentional or not, the average American can much more easily picture herself sitting at a restaurant with friends in Paris than she can see herself walking the streets of a “Hezbollah stronghold” in Beirut. So to my Lebanese friends, please, give us some grace. People in the West are scared too and trying to cope with a world that seems to be falling apart all around them, just like we are doing here in Beirut. But let us all remember that a cafe in Paris is not that much different from a cafe in Beirut. Different languages, yes. The menu isn’t the same and the weather is much warmer here in Lebanon. But the people sitting in the cafe for a break after a busy day, for a coffee and a chat with friends? The same. I have a whole head full of more thoughts. But this is getting long for a blog post and I can hear the water running through the pipes that have been empty for the past 24 hours, so I’m gonna get that shower while I can. Since I started writing this a few days ago in my head, many more people who are much smarter, and certainly more well rested than I am have written a whole host of articles about this…. I don’t necessarily agree with them all, but it’s good and helpful to get other’s perspectives as well. The more we know and can identify with “the other” – whether that be the Westerner or the Arab, the better we can love, the more clearly we can pray, and the more united we can be in the face of those who seek to kill and destroy.